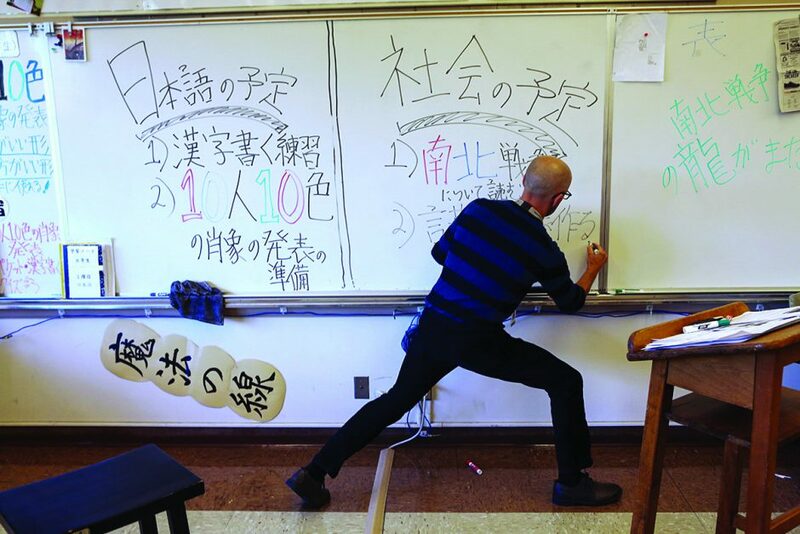 Matt Bacon-Brenes, a Japanese immersion history teacher at Portland’s Mt. Tabor Middle School, has been named the 2018 Oregon Teacher of the Year. Bacon-Brenes has been teaching for 29 years, 15 of them at Mt. Tabor. He began his teaching career in Japan as part of a teaching exchange program, where he gained an international perspective that he brings to his classroom today. Matt has become a pivotal figure in the nationally recognized Japanese immersion program at Mt. Tabor. Each spring, Matt organizes a two-week-long trip for students to travel to Japan to study Japanese culture and history. We sat down with teacher and OEA member Matt Bacon-Brenes to talk about teaching, his work around equity, and his vision for education. Q. Congratulations on being named Oregon’s Teacher of the Year! How does it feel? It’s certainly an honor, but I receive this on behalf of so many others that I have worked with — colleagues, parents, administrators. I don’t receive this on my own, and for that, I am grateful. Q. Is there anything you hope to accomplish with your recognition? I am hoping to spread the word that there are a lot of great things happen in public education, and there are great educators making that happen. I want to be an advocate for a public education that is rigorous, relevant, and accessible to all students. I believe public education and that it is the core of a strong democracy. As educators, we should use our collective voice to advocate for the resources we need to serve students. We need to advocate for more prep time, better professional development opportunities, better funding. Q. What influence did you want to have on students as you pursued a career as an educator? For me, it has changed over time. At first, I really enjoyed the idea of helping students grow and discover new concepts. But recently I have come to understand the enormous responsibility to to help students develop as critical thinkers and grow as informed citizens. I strive to help my students understand history from a variety of perspectives. As educators, we have a responsibility to facilitate this. This doesn’t just apply to history. This is part of every subject. Q. What is the most important issue facing educators today? Workload. There is an expectation that you are going to teach five out of six periods and that you are going to engage with students. It’s essential that we have the time to reflect, and improve as professionals — particularly to those new to the profession. With the right balance, you can achieve excellence in education and do the best for students. Q. You’ve done significant work around equity in your school. How can other educators begin to address these issues in their schools? These are not my ideas, and I feel blessed to be able to have had them shared with me. I have been taught that that addressing equity starts with the personal, the local, and the immediate. Addressing equity starts by looking within and examining how your life has been shaped by race and gender. This is essential before you can begin to change others. Once personal transformation occurs, you can be much more effective at addressing equity issues in your classroom with students. You then have the vocabulary and the stories from which you can draw to understand all the students that walk into your classroom. Q. How can educators work to improve education through your union? Educators have enormous power through OEA to advocate for excellence in education. As educators, we should use our collective voice to advocate for the resources we need to serve students. We need to advocate for more prep time, better professional development opportunities, better funding. We should also do as much as we can to support new educators entering the profession to make sure they have the resources they need. New educators should have access to mentorships with those who have spent time in the profession.